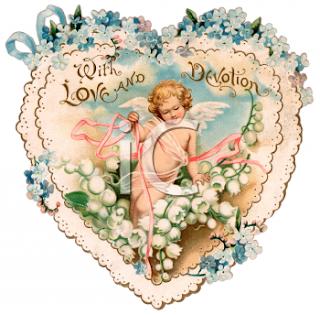 Valentine's Day is upon us and I confess that it's not a day I think all mushy gushy romantic thoughts about. Sure, it's a fun day to use as an excuse to do something special for the one's that you love (hence this post) but I've never been so emotionally wrapped up in it that I "lived and died" over the issue of whether or not I had a special valentine of my own. In fact, one of my favorite memories about the day (when I was a single person) was swapping gifts with my "friendly valentine" who was also single. We picked out or made cards for one another and sent each other surprise packages to be enjoyed. And enjoyed they were! I totally loved doing that as it caused me to "think outside the box." Now I'd like to take that concept and give away a box to one of you.....a box full of books. 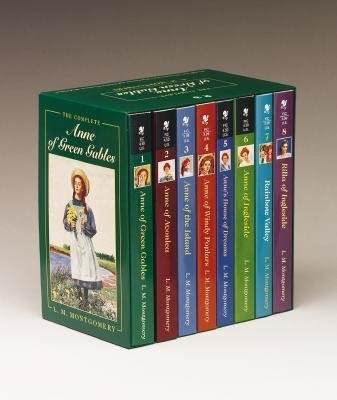 Specifically, I have one Complete Anne of Green Gables Boxed Set to giveaway! So if you have never read or do not own the series for yourself and would like to, well then by all means leave a comment below! The set is gently used and in great condition and I would love to pass it on to someone around these parts. (Perhaps then you'll be motivated to join in next year's Lucy Maud Montgomery Reading Challenge, eh?) Manipulative? Nah! To win? Leave a comment below. If you are a regular subscriber, you may leave TWO comments and consider this gift a thank you for your friendship and following! Contest open to U.S. Residents only and will remain open through Thursday, February 18th. In the meantime, stay tuned because I have a few other gifts to bestow upon you this Valentine's Day weekend! I just got the set for Christmas! You are so sweet to do this, Carrie! Don't count this as an entry, just a thank you! What an awesome giveaway! I'd love to win. I seldom comment but I do subscribe to you through bloglines and always enjoy your take on classics. I've been collecting Anne books but I don't have the complete set and they are mismatched...this would be awesome. We have Anne of Green Gables on Audiobook (unabridged) and my daughters love both it and the movie with Megan Follows. My husband blames much of the melodrama in our home on my girls being exposed to Anne too young. I think this is my first comment but I read regularly. I love Anne and would be soo excited to win. Oh, you KNOW I want to win this! And here's my second comment. Crossing my fingers! I already have the set so please don't enter me. I actually read Romeo and Juliet. So I'll post my review on V-day. I would love to win this!! My favorite movie is Anne of Green Gables:) Please enter me. Thanks!! Ooooh! I deeply regret that I sold my set of Anne books in a garage sale - what was I thinking?!?!? I would love, love, love to win this and return it to a proper place on my shelves. I would love to win this. Thank you for hosting such a great give-away! I don't comment much but I am a subscriber for the past few months. Thanks for hosting this! Carrie, I don't usually enter giveaways b/c I get so many review books, but I have never read any Anne books, so I have to put my name in the hat! I subscribe in google reader! What an awesome giveaway! You have definitely piqued my interest in the series! I would love to win these books! Thanks for your great blog! I love Anne! I'd love to have these to share with my kids and to read myself. Thank you so much for the giveaway. I don't go crazy about VDay either. My hubby is pretty good about gifts and such. Gifts are one of his secondary love languages. Sadly for him, it's NOT one of mine. I would love to win this awesome giveaway. I'm a new subscriber and I would love to win this set. I've never read these books! Gasp - I know, it's unbelievable!! I really love your blog - this is my 2nd comment. I'd love to read this set :) *Thanks* for the giveaway! I would love for Lily to have this set. Thanks for offering it as a giveaway! I LOVE Anne and it has been a long time since I've read the entire set. I'd love to win a set of these books! I would absolutely love to win this for my niece! Cool stuff, Carrie! I've only read the first couple of books, but I'd love to read more! And now for my second comment! I already have a set, but I'm going to enter here for my niece who borrows from my set!